From madman to eccentric genius, from painter to sculptor and even photographer, there are many words that could describe Salvador Dali, and there are as many superlatives that could describe his striking paintings. However, I will brush past the Persistence of Memory or other “greatest works“ clichés and seek out one that strikes me in a deep place; in my case it’s the ones influenced by atomic theories. In the early ’40s Dali, began to deepen his interest in Planck’s Quantum Theory, which further moved on to nuclear mysticism. Beyond the bright brush strokes and surrealist compositions, these paintings are interconnected by the belief that there is a conscious component that connects all human beings. Head Exploding is an image that stuck with me since the first time I saw it as a child; through its simplicity and expression. 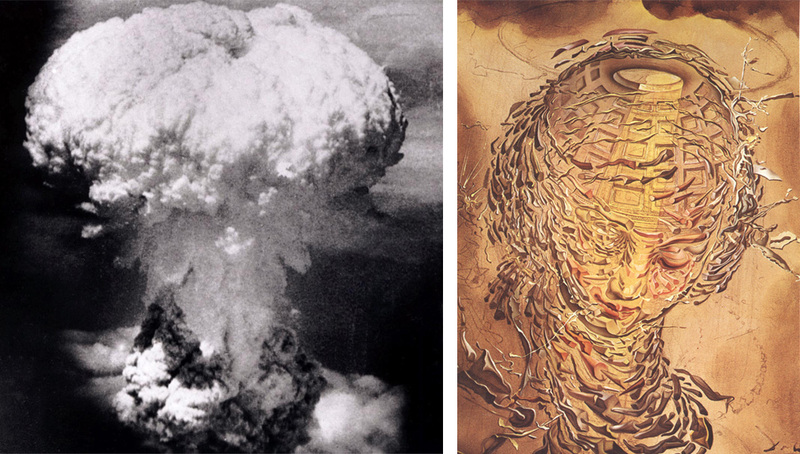 As inexplicable as my fascination was, I am now realizing that the beauty of it lies in the depth and layering arising from the physics theories and historical incidents of the atomic explosions that build the concept behind the artistic expression. The more I look at it, the more I see particles floating together to form an entity, rather than coming apart as a result of an explosion. 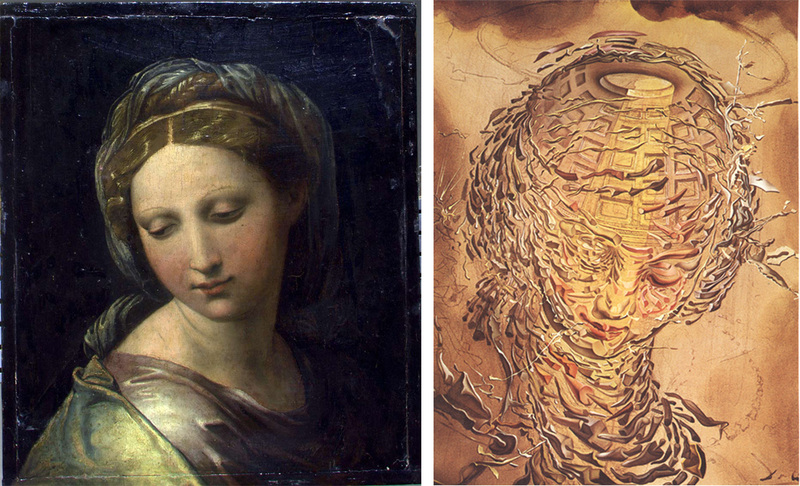 Dali uses contrasts in a skillful manner; through the smile of Raphael’s Madonna, into an explosion of atomic particles. By choosing a subject of pure holiness and serenity, he achieves a balanced harmony; expressing a duality of the divine which contrasts the human context at the time – that of nuclear warfare. The clouds in the upper part of the painting make reference to the mushroom cloud of the atomic explosion in Hiroshima and Nagasaki. On a different layer, the reference to the building of the Pantheon in Rome (represented in the skull section) and the paintings of Raphael, bring forward a romantic memory of another age and time, defined by artistic achievements and dedication. 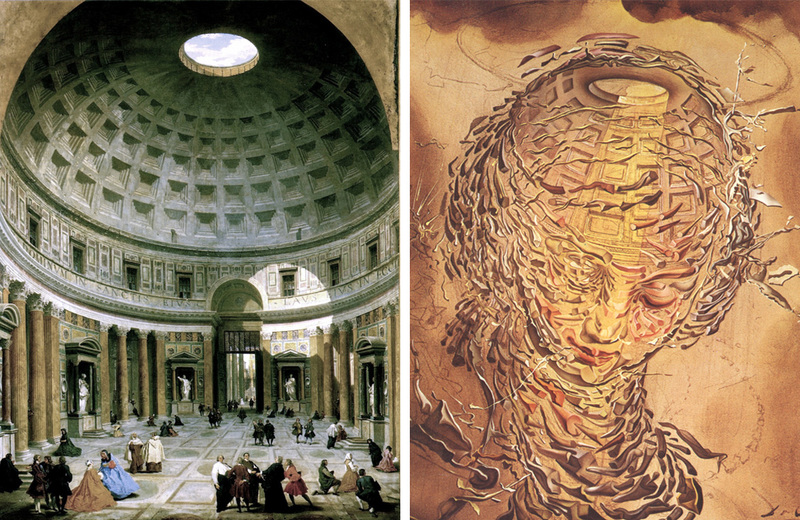 Although a modern artist, Dali posed a fascination of the classical period, being inspired by Renaissance artists such as Raphael and Michelangelo. The female is depicted in a holy manner, through the halo above her head and her eyes closed in a silent prayer. 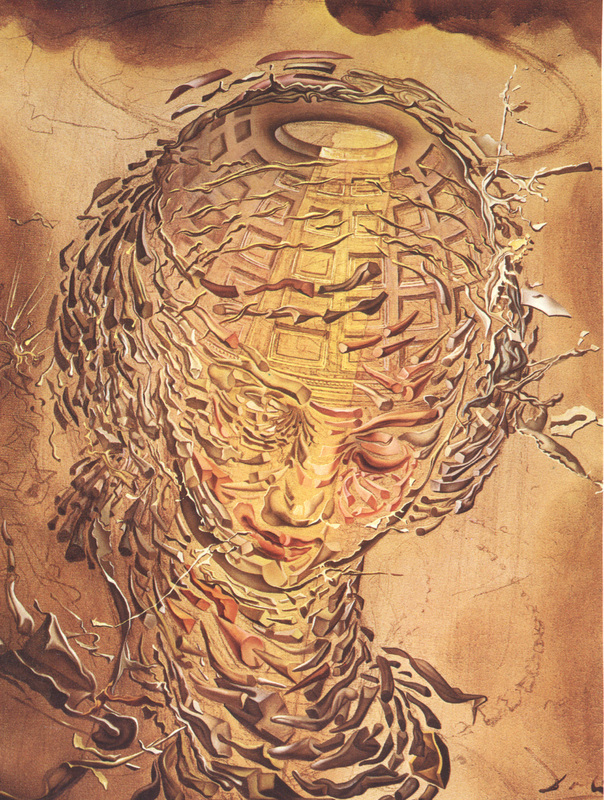 The exploded particles, represented through rhino horns (a typical leitmotif in Dali’s paintings) also resemble tears running down her cheeks. The Pantheon in Rome (118–128 AD) is a former Roman temple, one of the highest architectural achievements through its construction method. The name which refers to “a relation to the Gods”, enhances the divine concept of the masterpiece, and the building stands as one of the most symbolic religious architectural elements of classicism. From a stylistic perspective, the composition is clean and simple, devoid of unnecessary elements. The particles are arranged in circles, enhancing the dynamism of the painting. All flooded in the soft light of the golden hour – a dawn or dusk of humanity. It may not be definitive of Dali, but what makes this painting one of his masterpieces is the ability to express – not only dreams – but reality, in a surreal way that becomes a tangible expression of his concepts and beliefs. The perfectly blended components form another connection between worlds – the divine and the human, the past and present, art and architecture… war and peace!